When it comes to gift giving, it’s the thought that counts, and while homemade gifts are certainly thoughtful, a practical item fits easily into daily routines. Combine the best of both worlds by helping your child infuse everyday objects with sentimental brightness with these five kid – and adult-friendly DIY gift ideas. Add a dash of color to cooking with a set of striped utensils. 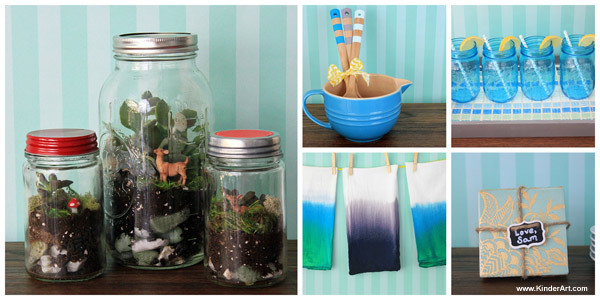 Stir up some fun with this easy and affordable project! Starting with a clean, dry surface, carefully wrap the tape around the utensil handle in your desired pattern of stripes, pressing the edges down firmly. Collaborate on coming up with a color combination for the project and then have your child paint the exposed areas between the tape stripes. The best way to prevent the paint from spreading beneath the tape is to use a minimal amount and apply it in coats for full coverage. Allow the paint to dry and slowly peel the tape away to reveal your striped pattern. Lightly spray the painted handles with a clear matte protective coat to extend the lifespan of your gift. Set a glass somewhere special with do-it-yourself decorative coasters. “If you like it then you better put a ring on it” doesn’t apply to wooden furniture and water stains, so a set of coasters is both pretty and practical as a gift idea. Check party and hobby stores for decorative cocktail napkins, and pick up tiles at your local hardware store. Cut the napkin to fit the tile, and pull apart the layers of paper until you only have one ply. Have your child use the foam brush to apply Mod Podge to the tile in even strokes and wait a few moments until the surface becomes tacky. Press the decorative napkin onto the tile surface; you should have a few precious seconds to reposition if this goes wrong the first time. Allow the glue to dry completely before applying another thin layer of Mod Podge over the napkin, paying special attention to the edges to prevent lifting. Go over the tile with one more coat when dry for extra durability. Use the waterproof adhesive to attach felt or cork to the bottom of each tile. Serve up some sweetness with a tile mosaic tray. Whether used for breakfast in bed or as a countertop organizer, mosaic tile serving trays are both unique and useful. Come up with a color scheme and have your child paint the wooden tray to match. Once dry, use the putty knife to apply a thin layer of tile adhesive to the bottom of the tray and start the process of setting the tiles in place — you can follow a design plan or let your child take the creative lead. Give the adhesive time to dry and then place globs of grout onto the tile and push and slide it into the open cracks using the flat surface of the grout float. Use the edge of the grout float to scrape up any excess and follow up with several wipes with a dampened sponge, rinsing it between passes. A damp rag will help you get into any nooks and crannies the sponge may have missed. Add a little life to your gift with a succulent terrarium scene. Miniatures such as deer, mushrooms or gnomes. Give the gift of green spending too much of it! Calling a terrarium practical may be pushing it, but this delightful and whimsical gift is almost self-sustaining, only requiring the occasional misting, and it can live easily on a porch, windowsill or table. Plus, they’re so much fun to make. Add small stones to the bottom of a jar to create a drainage area, and add activated carbon (also called activated charcoal, available in pet stores) to the soil if the terrarium will have a lid. Add your succulents to the soil, cover any exposed area with moss for some additional color and texture, and set your miniatures up to create a serene scene. Add a splash of brightness to the kitchen. Ombre is everywhere, and these colorful kitchen towels are just as handy as they are trendy. Fold the kitchen towel as you would over a towel rack (a hanger is helpful here) and have your child dip the ends into the bowl of dye. Don’t dip too deep—the dye will spread through the cotton, creating a beautiful effect. Soak the ends for a few minutes for additional saturation and then hang to dry with a plan to protect the area from drips. Rinse in cold water, dry and fold! Presents that are practical don’t have to be boring. Although construction paper and googly eyes will always have their place, adding a handmade touch to an everyday object is an easy way to create keepsake crafts that can be enjoyed for years to come. For more ideas on making age-appropriate art with your children, check out Shutterfly’s educational art guide.